North Dakota Heritage Center and State Museum in Bismark. Bismark North Dakota is home to several "must see" attractions that we strongly recommend that you take the time to discover and explore during your North Dakota vacation. One of the North Dakota top attractions in the Bismark Area is the world-class North Dakot Heritage Center and State Museum, which is one of the top state heritage centers found anywhere in the country. 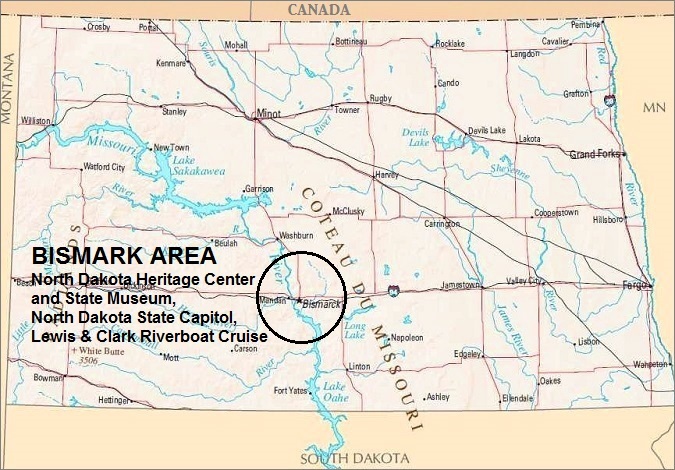 Right next door to the North Dakot Heritage Center is the North Dakota State Capitol Building, and along the Missouri River the Lewis and Clark River Boat is there waiting to take you on a cruise up the mighty Missouri River. 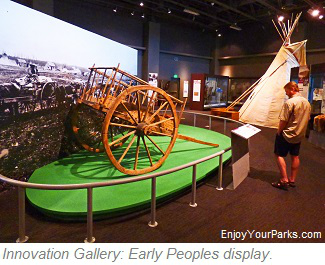 The North Dakota Heritage Center and State Museum is in our opinion one of the finest state heritage centers and museums in the country, and is definitely a "must see" while vacationing in North Dakota. 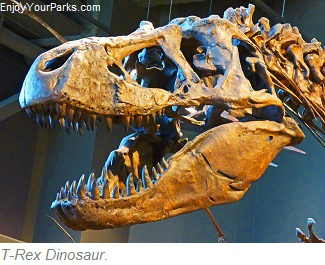 There is so much to see at this world-class center... and there is truly something for everyone in the family...from many incredible dinosaur displays that include a T-Rex skeleton, to the largest giant squid fossil found in the entire world, to rare native pottery to a space suite designed for a trip to Mars. 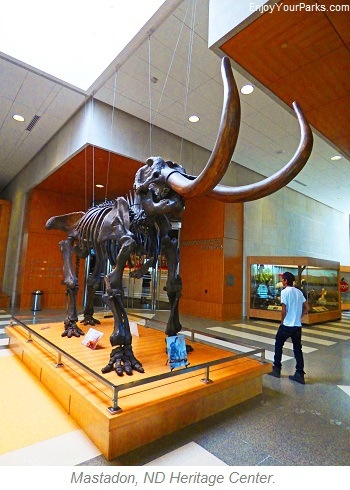 There are thousands of specimens and artifacts, as well as interactive exhibits and super high-tech displays that will not only spark your imagination, but will help you truly get a "feel" for just how great North Dakota truly is. 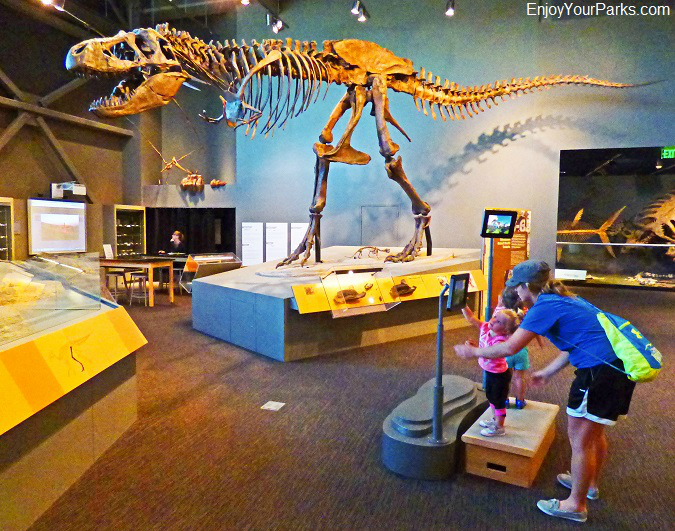 There are presently four amazing museum galleries that will trace North Dakota's history beginning at about 600 million years ago through the modern day oil boom. 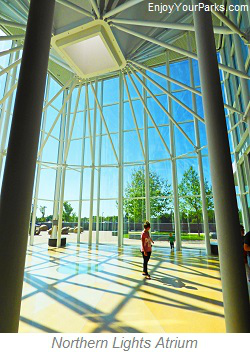 The gorgeous atrium at the North Dakota Heritage Center is special. In fact very special. The Northern Lights Atrium is the only design of its kind in the entire country. The amazing steel and glass structure gives recognition to early Native American architecture as it is constructed with 20 poles...which is the same as the Native American earth lodge construction. At night, special lighting makes it seem that the Northern Lights are glowing within the atrium! 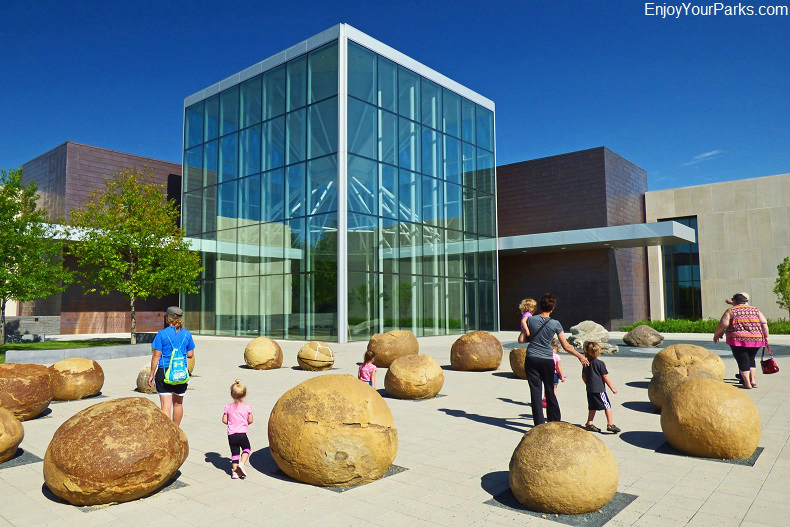 By the way, the giant round stones lying in front of the Northern Lights Atrium of the North Dakota Heritage Center are naturally occurring round stones called "Cannonball Concretions", which are found along North Dakota's Cannonball River. The Adaptation Galley in the North Dakota Heritage Center provides absolutely remarkable displays of dinosaurs... It's so impressive and fascinating that it's our personal favorite and we can't seem to spend enough time there. The Adaptation Gallery walks visitors through time... geologic time. You and your family will be amazed at just how world-class this gallery is, and you'll definitely enjoy seeing the life-sized skeletons of a Tyrannosaurus Rex getting ready to fight a Triceratops! There is also a 12 foot dinosaur sea turtle among the many other spectacular dinosaur displays within the Adaptation Gallery. You'll also meet "Dakota", which is a 67 million year old Hadrosaur fossil...which is one of only six known hadrosaur mummies that are naturally preserved. The skin is nearly all intact and there are even visible scales! 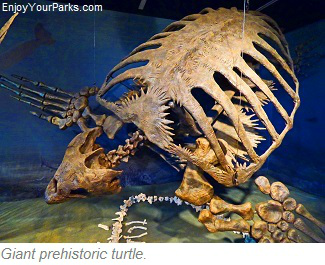 This amazing Hadrosaur fossil was found in North Dakota in 1999 near Marmath. T-Rex at the Adaptation Gallery, North Dakota Heritage Center and State Museum. 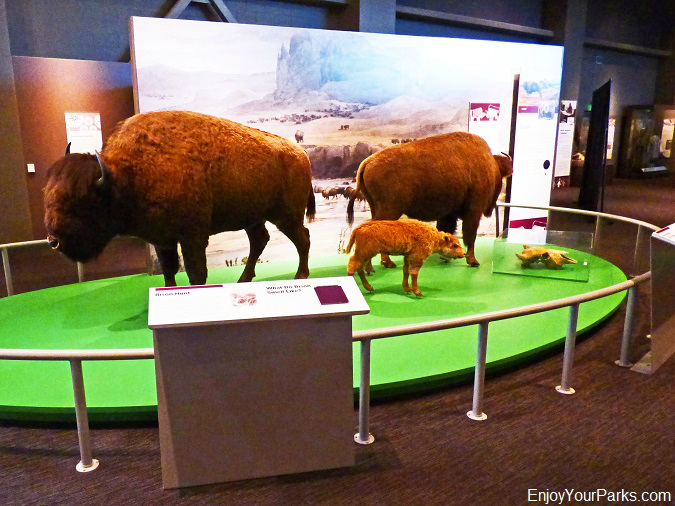 Buffalo display at the Innovation Gallery: Early Peoples. 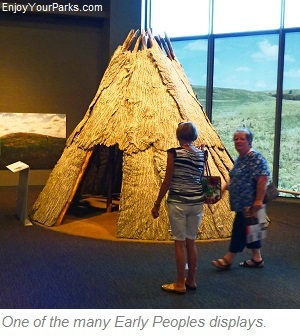 Center, where it features over 1,000 artifacts from early life in North Dakota that help tell the story of North Dakota's distant past of early people on the Northern Plains. One of the highlights of this gallery is a hand-painted 6 foot by 5 foot cyclorama painted by the nationally renowned artist Robert Evans of the Double Ditch Indian Village that depicts life there in the mid 1500s. The North Dakota Heritage Center also has a wonderful gallery called the Innovation Gallery: Yesterday and Today. This incredible gallery has six themes that include Industry and Energy, Agricultural Innovations, Conflict and War, Cultural Expressions, Our Communities, Our Lives, and Newcomers and Settlement. 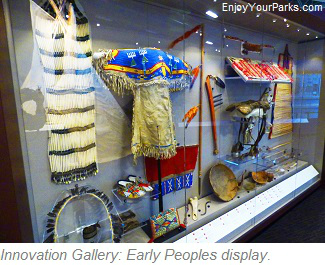 The Inspiration Gallery covers North Dakota's fascintating story starting at about 200 years ago, all the way to present times. 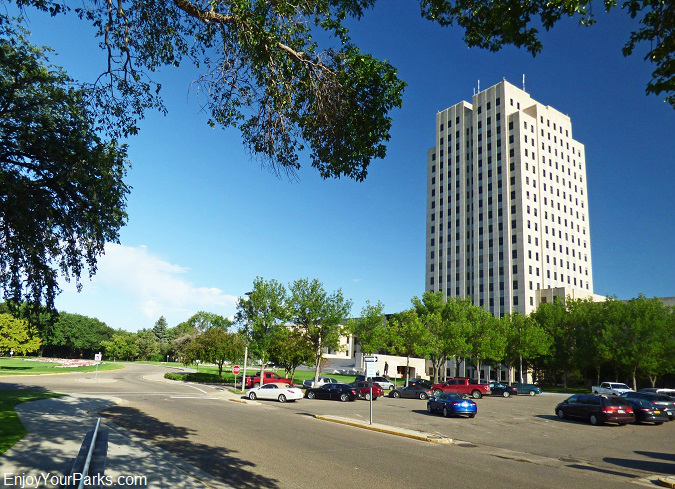 The main North Dakota State Capitol Building is the tallest building in North Dakota, towing 242 feet high with 21 floors. This classic "Art Deco" skyscraper was built between 1931 and 1934 after the original North Dakota Capitol Building burnt to the ground. Known as the "Skyscraper on the Prairie", the towering North Dakota State Capital Building offers guided tours throughout the week, and there is an observation deck on the top floor. North Dakota State Capitol Building in Bismark. 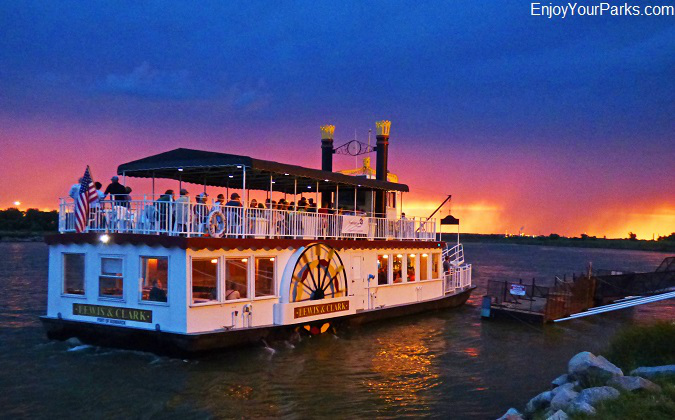 Owned and operated by the Fort Abraham Lincoln Foundation, tourists of all ages are welcome to experience a wonderful Missouri River riverboat cruise. Available from May through September, you have the choice of a daytime cruise or the popular dinner cruise at sunset. the Lewis and Clark Riverboat Cruise is fun, entertaining, and a great way to get on the legendary Missouri River. Lewis and Clark Riverboat on the Missouri River at Bismark, North Dakota.